Sept 17, 2015 SALVAGE – Official Press Release Circus Beyond the Ring Presents SALVAGE – a theatrical circus performance, rebuilding the future from broken pieces of the past. Opening November 14th and running through December 20, 2015 at Kinetic Arts Center in Oakland, CA. SALVAGE is an immersive circus performance chronicling the evolution of fractured survivors who have narrowly escaped the deepest ravages of a recent global catastrophe. performances available, get your tickets now because these shows always sell out. Feb 10, 2015 SHATTERED CIRCUS – Official Press Release Starring the Circus Spire Youth Troupe, SHATTERED CIRCUS is a powerful reminder of what makes us all human – our emotions. 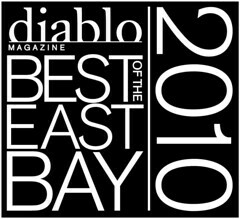 Jan 11, 2015 Kinetic Arts Center performs at Major Libby Schaff’s “Made in Oakland – Inaugural Festival. nnual Themed Circus Cabaret & Festival. March 20, 2014 The Submarine Show They are Back for One Night Only: Saturday, April 5, 2014 Same Two Guys; Same Small Submarine; New Twist on Their Explorations. Just as Before, You will Laugh as they Cry, Swim, Fly and Go a Bit Insane! The Submarine Show: Two explorers crash their little submarine at the bottom of the ocean, lose the key needed to restart the sub, and in searching for the missing key entertains us with a mad-cap journey across every kind of terrain – never saying a word. January 17, 2014 Offical Press Release CircoMorph 2014 CircoMorph: The Primordial Circus! is a circus show based in the concept that one atmospheric change can morph a world into a sprawling environment not previously imagined. Featuring the Circus Spire Youth Troupe; Directed & Conceived by Jaron A. Hollander. May 16, 2013 Kinetic Arts Center Presents the Circus Kids 4 Troupers 2013 Production of A Silent Circus: Flying off the Silver Screen! Jan 18, 2013 Kinetic Arts Center Presents the Circus Spire Youth Troupe 2013 Production of Inversion: A Disobedient Circus! Which Rules are We Going to Break Today? Oct 27, 2012 The New York Times Magazine explains “Why Women Can’t Do Pull-Ups.” Really?!? Oakland’s Circus Spire Youth Troupe Members Prove the Article Wrong! At Kinetic Arts Center, the Circus Spire Youth Troupe (comprised mostly of girls) bust out pull-ups everyday and are a huge source of pride for each of the girls. show of The Submarine Show and Fragment by A Mused Collective. Fringe Festival goers get to see these shows in Scotland; We get to see these shows first! Shakespeare’s ‘The Comedy of Errors’ One Weekend Only! 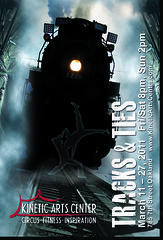 Tracks And Ties: Circus Magic, Locomotion & Connection running for 3 weeks only! 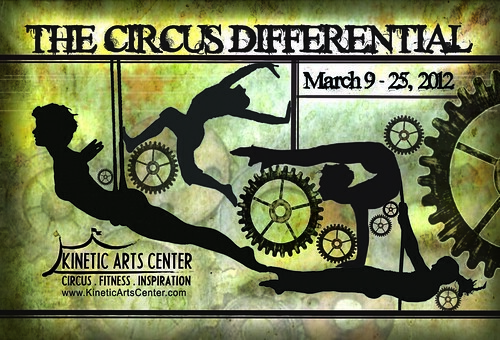 – Official Press Release Kinetic Arts Center’s Circus Spire Youth Troupe performs for three weeks only in a show about circus magic, locomotion and connection. Tracks and Ties, Starring Circus Spire Youth Troupe – Fact Sheet Circus Spire Youth Troupe Stars in TRACKS & TIES: Circus Magic, Locomotion & Connection. Inhabitants of an abandoned train station fill eternity with circus magic connected to the power of trains, tracks and ties. Type 1 Diabetes Can’t Keep 13 Year-Old off the Trapeze – Official Press Release Thrive 2010!FeaturesKineticArtsCenter’s Danielle Foreman in a Solo Aerial Act on Static Trapeze in Support of Juvenile Diabetic Research Foundation on June 19, 2010. Frances Tiffin Goes to Circus College – Official Press Release KineticArtsCenter’s Senior Circus Spire Trouper (and Berkeley High School Senior) is College-Bound to CircusSchoolin Quebec. Students Going to Smirkus – Official Press Release Kinetic Arts Center Circus Students Run Away to the Circus for the Summer: 70 Shows in Seven Weeks Throughout New England with Prestigious Circus Smirkus 2010 Big Top Tour! Eemax and Zurno’s Amazing Circus Humans – Official Press Release Circus Spire – Kinetic Arts Center’s Fantastic Youth Performing Troupe — Stars in “Eemax and Zurno’s Amazing Circus Humans” a circus show where theatre, puppets, contortionists, acrobatics, circus aerials and clowns brings to life a magical parallel world. Kinetic Arts Center Opens in Oakland: A New Circus is in Town! http://ww2.kqed.org/arts/2015/11/19/cy-and-davids-picks-lucero-body-music-disgraced-and-more/ to hear the complete podcast.